After driving my 928 for almost 20 years and building many hot rods I’ve decided to put a 928 engine in a hot rod. It will be a volks rod with a 915 transaxle from a 911. For simplicity, and because I found one, I am using a CIS engine. I’ve read a lot of material about the K Jet but still I have some questions I need help with from someone w/ more practical experience. If you can help w/ any of these questions, please do. I didn’t get the pump, accumulator and filter, can I just get a 80 psi or even 100 psi pump and filter and run it to the engine? Doesn’t the pressure outlet valve on the distributer keep it at the right pressure? Do I really need an accumulator if I run the pump during ignition on? If this is going in a hot rod and I run it at 60 degrees F. and up, or if I just give it a little extra throttle, can I get away with eliminating this component? On the 928, at least on this engine, there are hoses that tee off the air bypass circuit, not sure where they go, probably should just be capped and leave only the main bypass route? On this engine in the spaghetti of hoses there is actually one hose that tees in and goes around, bypassing the aux valve, shown with the two yellow arrows in the photo, should this be there? 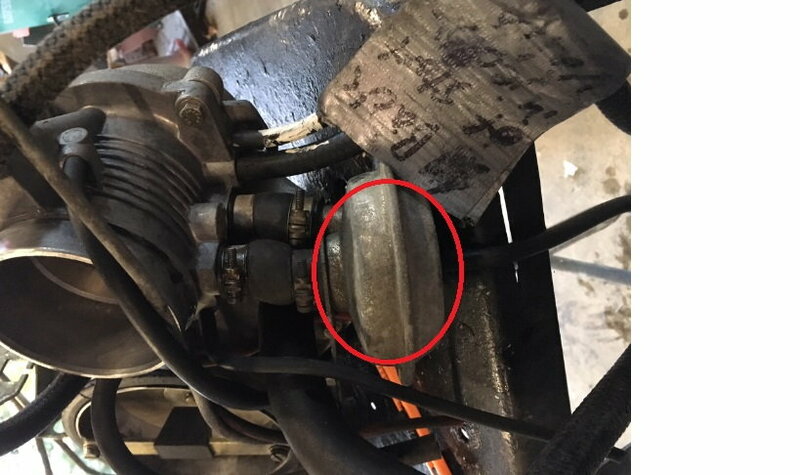 What is the big vacuum canister looking thing that is mounted to the throttle body (3rd picture)? It looks like it has two ports, one above and one below the throttle body. It appears it might bypass the throttle body just like the auxiliary air valve. What is it? It also has a vacuum port which is hooked to two different vacuum canisters. What is this whole mess. Can I remove it or If I need to keep that component, what signal does the vacuum port need? Every CIS engine made by any of the manufacturers had an accumulator. It is a shock absorber so the injectors don't get blasted with 100 lbs of fuel pressure, all at once. You will probably want to use one. CIS engines have an extra injector that sprays raw fuel into the intake manifold for cold starting. The valve in your 2nd picture opens and allows more air into the intake....to mix with the extra fuel. You can remove it, but it will be very rich on start-up. Of course, you can allow additional air in by opening the throttle, but you will always be trying to find the proper amount of air needed, instead of it being more automatic. 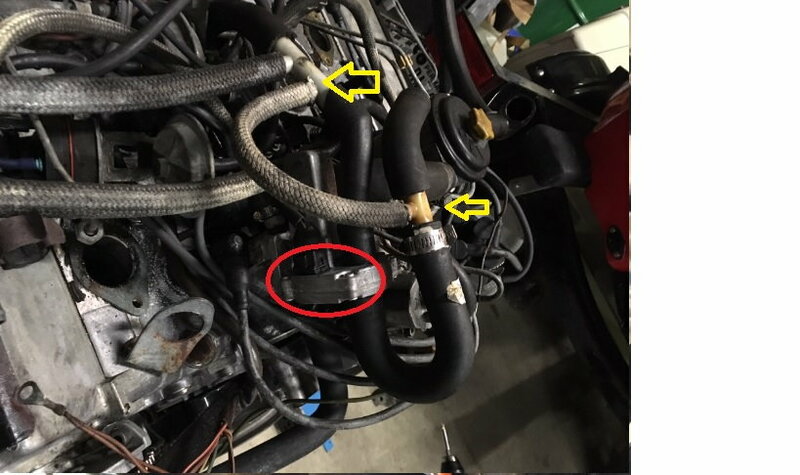 The tee and the hose with the yellow arrows used to have another air bypass in the middle of that hose, for increased idle speed with the A/C on....someone removed it. The third picture is a de-acceleration control valve, designed to allow the engine to return to idle slower to burn off hydrocarbons and CO....and to keep the engine from stalling. Porsche makes plugs for the ports....try removing the valve and plugging the ports. If it stalls returning to idle (once mixture is properly adjusted) you might need it, but I doubt it. I have removed the decel valve on my '79, but may put it back. Idle tends to take a dive when coming to a stop and will stall when not fully warmed up. May also be I have a vacuum leak somewhere. I thought the accumulator was intended to help hold pressure during cool down, for warm starts? The usual max pressure quoted is 75 psi, so any pump designed for injection should do - pressure controlled by the FD regulator - as long as it can deliver the spec volume ~ 1350cc/30 secs. When I got my car it had a pump off an LH injection 928, and worked fine in ambients of 120F. I'll probably just try a generic fuel pump without the accumulator and make sure it runs with ignition. Has anyone tried to run the 928 w/out the accumulator? So for the aux air valve, it sounds like I just need the main bypass tubes and can eliminate the bypass for AC and all the other hoses that tee off of it? ?? Thanks for the explanation on the de acceleration valve. It's not a problem to just leave it. On my engine there is a vacuum hose that comes from that large canister to another canistor and then another, it is confusing. Can I just run that vacuum hose directly to manifold vacuum? I have the same engine in my 928 car, but as you all know, all of these parts, while they are close to the surface are totally buried and the hose routing and untraceable without tearing things apart.